Many of us know Liszt's Hosanna is an important part of our repertoire for solo bass trombone and organ. It is arranged by Liszt himself, and was published in 1867 in Weimar. What was the "bass trombone" to Liszt at that time?? Was it a Bb/F trombone that was invented a few decades earlier?? (Were they widely in use by that time??) it does have what we call trigger range. Or did he have trombones in other keys in mind?? Or valve trombones in lower keys?? Have you checked out Will Kimball's website? There is a lot of useful information about instruments, especially in the timeline. It probably was something like a G bass (one of those basses with a huge handle attached to the slide). I'm thinking that these were probably more common than the Bb/F trombone that we know today. Quote from: harrison.t.reed on Jan 31, 2016, 08:36AMIt probably was something like a G bass (one of those basses with a huge handle attached to the slide). I'm thinking that these were probably more common than the Bb/F trombone that we know today. The G bass was used in Britain. In Europe there was an F Bass, but by 1867 the "Tenor-Bass" had supplanted all those other instruments. The instrument Belcke used for the David Concertino was nominally a bass trombone and was a largish bore Bb. Calling Howard Weiner... Very definitely not a G bass. Almost certainly not an F bass. Would bet money on it being for Bb/F, in that area at that time. But which bore size, and what kind of design? Various were in use. Need someone who knows this stuff to comment - Howard or nobody, pretty much. Quote from: MoominDave on Jan 31, 2016, 10:49AMCalling Howard Weiner... Very definitely not a G bass. Almost certainly not an F bass. Would bet money on it being for Bb/F, in that area at that time. But which bore size, and what kind of design? Various were in use. Need someone who knows this stuff to comment - Howard or nobody, pretty much. Wow, what a lead in! Thanks, Dave! Liszt composed the "Hosannah" in 1862 (publ. 1867) for Eduard Grosse, who was trombonist and double bass player in the Weimar Court Chapel. He was for many years also Liszt's confidant, copyist, and traveling companion. At the groundbreaking for Wagner's Bayreuth festival theater in 1872 Grosse played third trombone, and then contrabass trombone during the first festival season in 1876. Given the time and place, it seems most likely that his "normal" instrument would have been a larger-bore tenor-bass trombone in B-flat/F. Based on the few measurements I have at my disposal, I would guess that it had a bore of ca. 14 mm or 0.55 in. I have to pass on the model, although it may well have been a Penzel (Leipzig), but in any case an instrument modeled on the trombones developed by Sattler (Leipzig) just a few decades earlier. Howard, as always, thank you very much for generously sharing your knowledge. Incidentally, just by association of the time period--I am slotted to play Bruckner D-minor Mass (composed in 1864) in March. I will be playing the third part. Would it be the same thing?? Since this is his sacred piece, the performers back then I believe would more likely to have been church ensemble (Old Linz Cathedral was the site for its premiere), with many of the brass players drawn from local military band (I could be wrong). As for the instrument, the closest I have is a Kurt Scherzer Bb/F, but it is definitely a tenor bore (single bore .505" or so by my unreliable measurement). A colleague a couple of hours away has a Schopper bass trombone that would be perfect (if indeed that's the kind of instrument for the piece). Quote from: MaestroHound on Feb 15, 2016, 09:53PMHoward, as always, thank you very much for generously sharing your knowledge. QuoteIncidentally, just by association of the time period--I am slotted to play Bruckner D-minor Mass (composed in 1864) in March. I will be playing the third part. Would it be the same thing?? Since this is his sacred piece, the performers back then I believe would more likely to have been church ensemble (Old Linz Cathedral was the site for its premiere), with many of the brass players drawn from local military band (I could be wrong). It just so happens that a Viennese colleague has been researching the use of trombones and other low brass in Bruckner's music -- he sent me his findings a couple months ago, and I'm now in the process of translating them into English. Basically, he has come to the conclusion that during Bruckner's time in Linz and later in Vienna, the trombones in use were valve instruments: The usual Austrian orchestral and military band sections being made up of two tenor valve trombones in B-flat and one bass valve trombone in F. I've known for a long time that slide trombones were reintroduced at the Vienna Court Opera in 1883, but now we have documentation that the Court Chapel remained on valve trombones until 1907. As for your upcoming performance, I would say that you should just choose an instrument that you feel comfortable with and that will allow you to make the sound you feel is appropriate. And, of course, have fun! Quote from: HowardW on Feb 16, 2016, 01:57AMBasically, he has come to the conclusion that during Bruckner's time in Linz and later in Vienna, the trombones in use were valve instruments: The usual Austrian orchestral and military band sections being made up of two tenor valve trombones in B-flat and one bass valve trombone in F. I've known for a long time that slide trombones were reintroduced at the Vienna Court Opera in 1883, but now we have documentation that the Court Chapel remained on valve trombones until 1907. Bruckner's symphonies were scored for valve trombones up to and including No. 6. Nos. 7-9 are scored for slide trombones. Since he wrote them for performance by the Vienna Philharmonic Orchestra, it goes without saying that once the orchestra switched to slide trombones (and therein lies a tale, since the trombonists in the orchestra were given the opportunity to learn the slide instrument and switch, but some evidently couldn't or wouldn't, the first trombonist in particular being replaced by a newly appointed German), the parts became significantly more pedestrian. One only has to compare the fast writing in Nos. 5 and 6 with the later symphonies to see how the limitations of the slide instrument imposed restrictions on Bruckner's ability to writing fast-moving passages. Ah, of course. Should have known that! Thank you again Howard, and Ed, too! Allways fun to read Howard and Ed. Knowledge! Quote from: MaestroHound on Feb 15, 2016, 09:53PMIncidentally, just by association of the time period--I am slotted to play Bruckner D-minor Mass (composed in 1864) in March. Reviewing the writing in the D minor mass, what is perhaps most remarkable is that Bruckner's relative inexperience in writing for orchestral forces becomes evident in particular in the way he treats the bass trombone. Remembering that by 1864 the older F and E flat bass trombones were long since obsolete, it is perhaps all the more remarkable that Bruckner writes repeated forays into the high register (above top line A) and very rarely ventures towards the bottom or below the bass staff - surely the defining characteristic of the instrument. What is manifestly obvious here is that Bruckner's isolation in St. Florian and Linz comes to bear in the inexperienced handling of the instrument, which improved with time spent in Vienna. However, the writing is still quite high, all the more so after the introduction of a bass tuba in Symphony No. 4. It is instructive to compare the original version of Symphony No. 4 with later revisions, as the third trombone part in the earliest incarnation is very much a bass part, rather than the inner voice, which characterises his later works. off the topic of Liszt's Hosannah, but on the subject of Bruckner and Linz, I would like to know if anyone can explain the following. There are references to church regulations for funeral in Linz and other historical references to the use of equali/aequali pieces for trombones in Linz, including references to there being a large number of such pieces. I have even seen references to there being "hundreds" of such pieces. All that seems to have come down to us are the Beethoven, Bruckner and Lambel pieces. I have seen some material from Mr. Solomon on the Bruckner Aequali here on the forum. Perhaps you fellows know something about what happened to the other pieces? Perhaps the trombone players merely played chorales? perhaps when the Cathedral had a fire the music was lost? Perhaps your contacts in Austria know something? Quote from: Mark LaFratta on Feb 16, 2016, 08:42AMoff the topic of Liszt's Hosannah, but on the subject of Bruckner and Linz, I would like to know if anyone can explain the following. There are references to church regulations for funeral in Linz and other historical references to the use of equali/aequali pieces for trombones in Linz, including references to there being a large number of such pieces. I have even seen references to there being "hundreds" of such pieces. All that seems to have come down to us are the Beethoven, Bruckner and Lambel pieces. I have seen some material from Mr. Solomon on the Bruckner Aequali here on the forum. Perhaps you fellows know something about what happened to the other pieces? Perhaps the trombone players merely played chorales? perhaps when the Cathedral had a fire the music was lost? Perhaps your contacts in Austria know something? In 1909 a Linz newspaper published an article entitled "Der letzte Turnermeister von Linz" (The last director of Linz's tower musicians) about Franz Xaver Glöggl, who was the fellow who asked Beethoven to write the Equali. The article gives the following information: Glöggl compiled a collection of 5000 pieces for the musicipal church; he himself owned a "literary library" of 250 works, a "practical music library" of 100 vocal and 1200 instrumental pieces, over 60 instruments, a small collection of engravings of famous musicians, and autograph manuscripts. He sold the instruments, engravings, and autographs to the Gesellschaft der Musikfreunde in 1824. According to the Austrian musicologist Othmar Wessely, who was a native of Linz and most probably knew were to search, none of the other music has survived. I wasn't able to find anything at the Gesellschaft der Musikfreunde. But if you feel like taking a trip to Linz and looking around, don't let me stop you. Thank you Professor Weiner. I have read that Mr. Gloggl also served as the Kapellmeister of the Linz Cathedral and that he served in that role at the old Cathedral (today called St. Ignatius I think). I know that in the mid 19th century a new Cathedral was built in Linz. I once heard about 8th hand that in old cabinets somewhere in the old Cathedral there are lots of documents and music that was passed down from one music director/organist to another that have not been given much attention as they are just there with no organization and were more or less left behind in the old Cathedral when the Diocese moved everyone to the new Cathedral. Sounds somewhat fanciful but would be very interesting if true. I have also seen references that Mendelssohn wrote a couple of dozen pieces he called "Equale." I have seen one published as Equale No. 3 edited by Glenn Smith (Detroit Symphony some years ago??? ), but it really seems like a vocal piece for men's choir. Do you know anything about these so called Mendelssohn Equali? Quote from: Mark LaFratta on Feb 17, 2016, 08:32AMThank you Professor Weiner. Oh! I think I've just been promoted! -- But seriously, I am neither professor nor doctor, and in any case we all tend to be on first-name basis here. But of course it's your decision if you want to remain so formal. QuoteI have read that Mr. Gloggl also served as the Kapellmeister of the Linz Cathedral and that he served in that role at the old Cathedral (today called St. Ignatius I think). I know that in the mid 19th century a new Cathedral was built in Linz. I once heard about 8th hand that in old cabinets somewhere in the old Cathedral there are lots of documents and music that was passed down from one music director/organist to another that have not been given much attention as they are just there with no organization and were more or less left behind in the old Cathedral when the Diocese moved everyone to the new Cathedral. Sounds somewhat fanciful but would be very interesting if true. It might have been true at one time, but I tend to doubt that the stuff is still there. I think there is still a slight chance of finding troves like this in the former East-block countries, but hardly in Austria today. QuoteI have also seen references that Mendelssohn wrote a couple of dozen pieces he called "Equale." I have seen one published as Equale No. 3 edited by Glenn Smith (Detroit Symphony some years ago??? ), but it really seems like a vocal piece for men's choir. Do you know anything about these so called Mendelssohn Equali? No, I don't know anything about them, although I just looked this up in a Robert King catalogue from 1986 -- so Equale No. 3 was available already thirty years ago, and is still available today. Nevertheless, I doubt very much that they have anything to do with a local tradition from the Upper Austrian area around Linz from which the Beethoven, Bruckner, and Lambel Equali evolved. But I'm going to the library tomorrow anyway, so I'll see if I can find more information. Quote from: Mark LaFratta on Feb 17, 2016, 08:32AMI have also seen references that Mendelssohn wrote a couple of dozen pieces he called "Equale." I have seen one published as Equale No. 3 edited by Glenn Smith (Detroit Symphony some years ago??? ), but it really seems like a vocal piece for men's choir. Do you know anything about these so called Mendelssohn Equali? Here's the word: There are no equali in Mendelssohn's oeuvre. There are a number of pieces for four male voices. So it is probable that somebody thought they might work well for trombone quartet and designated the transcriptions as "Equali" in the erroneous asumption that an equale is merely a piece with equal parts. Quote from: HowardW on Feb 18, 2016, 08:20AM So it is probable that somebody thought they might work well for trombone quartet and designated the transcriptions as "Equali" in the erroneous asumption that an equale is merely a piece with equal parts. So, what is an equale? I recently played Beethoven's 3 and, if I ever get the opportunity again I would be interested to know what I am playing. Quote from: Stewbones43 on Feb 18, 2016, 09:04AMSo, what is an equale? I recently played Beethoven's 3 and, if I ever get the opportunity again I would be interested to know what I am playing. It is funeral music to be played by trombones (or other instruments) in alternation with the sung Miserere during the procession from the house of the deceased to the church and/or graveyard. If you want to know just about everything about Beethoven's Equali, take a look at my article "Beethoven's Equali (WoO 30): A New Perspective," Historic Brass Society Journal 14 (2002):215-77. Quote from: HowardW on Feb 18, 2016, 12:49PMIt is funeral music to be played by trombones (or other instruments) in alternation with the sung Miserere during the procession from the house of the deceased to the church and/or graveyard. Thank you very much, I will look up your article. Having passed my "Three score years and ten" I probably still have time to contact some old students and get them organised to play for my wake, although many will be worried about any sudden contact and will start searching for mouthpieces and music they borrowed many years ago and never returned. Quote from: HowardW on Feb 16, 2016, 01:57AMAs for your upcoming performance, I would say that you should just choose an instrument that you feel comfortable with and that will allow you to make the sound you feel is appropriate. And, of course, have fun! Just in case anyone was wondering, we went with your advise above and went with what were available to us that were comfortable for us. It resulted in a "broken consort" of instruments that are, at least individually, not impossible for the time/area style-wise at least, but would probably not have been used together! A Kurt Scherzer slide trombone with F attachment on third, a Heinem slide trombone on second, and a valve trombone whose maker's name escapes me on first. I think we made it work somehow. We did have fun for sure. Love the "sidewinder" trumpets. Glad you folks had fun. Quote from: HowardW on Jan 31, 2016, 12:44PMWow, what a lead in! Thanks, Dave! I'm resurrecting another old topic, just to chime in with some doubts that are starting to arise in my head, that B flat/F trombones were really so common in the 1860's and 70's. We do know that Sattler first came up with the idea and built an instrument for Queisser to play in 1839. None have survived however and I'm actually wondering now if very many were built. There are a few more Penzel trombones extant (I own one...) but I also don't know anyone that has seen an original Penzel with a valve. Perhaps there is one somewhere... and I really want to see one. I have not actually seen any B flat/ F trombones built before 1880. I searched the MIMO catalogue. None of the instruments in the Grassi catalogue with valve date from the 19th century as far as I remember. Perhaps there are some old catalogues with Bb F trombones pictured, but the ones I've seen are certainly late 19th or early 20th century. What I would really love to see would be a Penzel catalogue, if such a thing ever existed. Or a B flat/F trombone from the 1850's or 1860's. In any case all of the really old large bore trombones that I have seen (Sattler, Penzel, G.Ullmann) are straight B flat instruments. The idea had made its way from Leipzig to the US by way of H. W. Moennig, possibly as early as the 1850s, certainly no later than 1883. The use of the Berlin valve certainly indicates that even in the tradition of the region that spawned the Sattler instruments, a rotary valve was not codified as standard on this type of instrument. 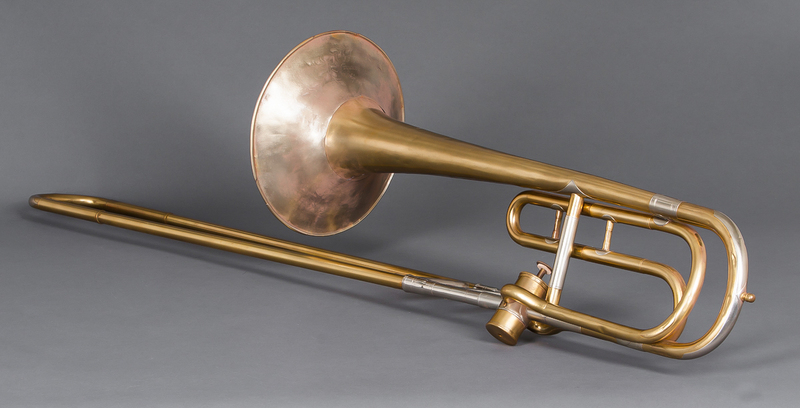 See my previous post on the AMZ description of the new Sattler trombone: Sattler's F valve. Even if there are no extant instruments from the 1840s and 1850s, this does not mean they didn't exist and weren't documented. See also my previous posts (When did the large-bore bone appear? and trombone in the orchestra) drawing on the thesis of Ottmar Schreiber. It is apparent from his research that the new Tenorbaßposaune was in widespread use throughout the German-speaking lands within just a few years of its inception. The only places in which the older bass trombones lingered on were the military, where the F or E flat bass trombone was in use certainly until WWI, and the church, where smaller bore trombones, presumably in complete sets, were still used. This may have also contributed to the availability of such instruments long after they should have become obsolete, as my own post-WWII F bass by the East German firm Sächsische Musikinstrumenten Fabriken VEB dates from after the foundation in 1947. Quote from: Edward_Solomon on Nov 24, 2016, 09:15AMSee my previous post on the AMZ description of the new Sattler trombone: Sattler's F valve. Even if there are no extant instruments from the 1840s and 1850s, this does not mean they didn't exist and weren't documented. Thanks for that tip about Schreiber. I'll try to find a copy of that somewhere. Part of my challenge at the moment is to come up with a blueprint for how a Sattler/Penzel trombone with F valve would have been set up. My 1870's Penzel tenor can form a perfectly good model for an mid 19th C tenor-bass trombone insofar as for bell form, shape of the bell and slide bows, and slide dimensions are concerned. We even know that Sattler had invented his own valve design (in 1821, a design which later became the Vienna pump valve) but I doubt if this design could be applied to a trombone.... There are also no extant brass instruments with Sattler's valve as far as I know.